Creating festive Halloween craft projects is an excellent way to prepare for the holiday, but you don't need to spend a lot of money to have an enjoyable crafting experience. There are several projects you can make that rely on repurposing materials you likely already have around your home. Turning fall leaves into cute little ghosts (pictured above) is a fun project suitable for young children. 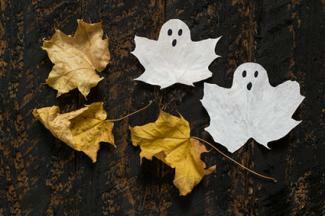 Older children can use their painted leaf ghosts as accents for handmade cards to send to family and friends. Spread newspaper on your work surface and arrange your dried maple leaves across the newspaper. Paint each leaf white, using two coats of paint if necessary. When the white paint is dry, use a black marker to add eyes and a mouth to make a cute little ghost. This cute bat and moon decoration makes an excellent Halloween project for young children. It's also a fun way to teach children about how simple shapes can be joined to create more complex figures. Paint the paper plate yellow using your watercolors. Set the plate aside to dry. Cut two large right angle triangles, one medium circle, and two small right angle triangles from black construction paper. 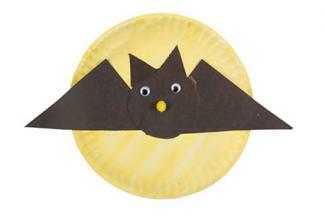 Glue the construction paper shapes to the paper plate to make a bat shape. The two large triangles should be placed on the left and right sides to make the bat's wings. The circle should be in the middle, slightly overlapping the edges of the two triangles to make the bat's body. The two smallest triangles should be at the top to give the bat ears. Finish your bat by adding two self-adhesive wiggle eyes and a yellow pom-pom nose. 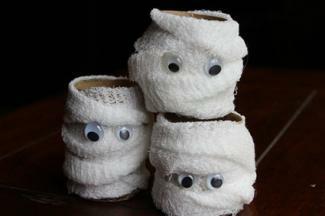 With a few minor modifications, empty paper towel rolls can be transformed into adorable little mummies for Halloween. They can be used as napkin rings or grouped together to make a fun table decoration. Cut the paper towel rolls to the desired lengths. Cover each paper towel roll section with a thin layer of liquid glue. Wrap gauze around the rolls, adding more glue as needed to keep the material in place. Finish each mummy by adding two self-adhesive wiggle eyes. Don't toss those empty glass jars! Once you remove the labels, you can easily transform them into cute pumpkin treat jars that can be used as party favors for older kids and adults, or small gifts for friends and family. Wipe down the glass jar with rubbing alcohol to remove any traces of dirt or oil that could interfere with your painting. 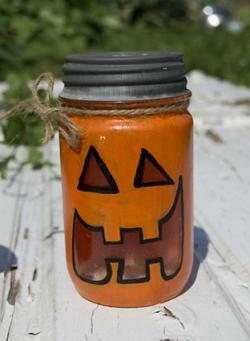 Use masking tape to create a jack-o'-lantern face on the jar. Paint the jar with the orange acrylic craft paint. You may need to use more than one coat of paint to get the desired level of coverage. Carefully peel away the masking tape to reveal your jack-o'-lantern face. Use black acrylic paint and a fine tipped paint brush or a paint marker to outline the jack-o'-lantern face. Tie a small bit of twine around the rim of the jar or around the lid, and fill with the wrapped candies of your choice. Small bits of wood left over from previous woodworking or home improvement projects can be transformed into cute pumpkin decorations with a quick paint job. These make eye-catching outdoor decor pieces perfect for Halloween. Paint the wood completely using orange acrylic paint. Sketch out a jack-o'-lantern face in pencil. Use black and white acrylic paint to fill in the face. Use the wood glue to attach a small, thick twig to the top to make a pumpkin stem. Tie a bit of raffia or twine around the pumpkin stem for a decorative finishing touch. Making DIY potion bottles is the perfect Halloween craft for older children who want to explore the spookier side of the holiday. Use a marker to sketch out your design idea for your potion bottle. 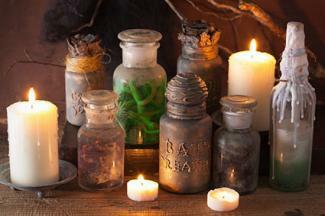 Your bottles could describe what the potion ingredients are, such as "Eye of Newt" or "Toad Stools." You could also go for a more general "Danger" or "Beware" label. Paint the entire container with black acrylic craft paint, using two coats if needed to ensure complete coverage. When the black paint is dry, use sponges to add dark brown and gold highlights to give the bottle an antique look. Apply the paint lightly so the black undercoat still shows through. If needed, you can try slightly diluting the brown and gold paint with water. Additional thrifty Halloween craft project ideas can be found by visiting the following helpful links. These printable crafts feature templates you can use to make a 3D paper pumpkin, a monster mask, and a spooky chain of paper spiders. Use these Halloween card templates to create three different printable Halloween cards: a pumpkin, a ghost, and Frankenstein. Try these projects that include votive candle holders, mini pumpkin candle holders, a Halloween wreath, and a festive table centerpiece. 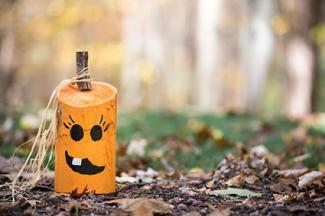 Halloween crafts for preschoolers include easy pumpkin decorations, making costume masks, and customized treat bags. Fold origami paper bats to add a spooky touch to your Halloween decor. These can be made with a variety of different papers. Once you start thinking about all the supplies you already have in your house, you'll have no problem coming up with even more Halloween craft ideas for you and your kids to make. And, with all your finished projects on display, you'll have the most festive house on the block when October 31 arrives!